Italy’s Lottomatica lottery, also known as Gioco del Lotto (“the lottery game”), is a tri-weekly game with a 5/90 format that differs heavily from pretty much every other lotto in the world. While this will excite some and baffle others, Lottomatica is definitely a unique lottery that offers OK odds, decent prizes (even if you match only a single ball), and gameplay that is more in line with betting than traditional lottery games. But is it worth your time? We’ll explore that question in detail below. Lottomatica would likely never exist if it wasn’t for a very different type of lottery game that was introduced in Florence in 1528. In this early game, five noblemen from a total of 120 would be randomly chosen to become members of the Greater Council of the Republic—quite an honorific title. Eventually, the total pool of noblemen to choose from decreased to 90, and in 1734 the activity became a proper cash-based lottery that determined not who became a city official but rather who became richer. Initially, draws were held a few times per year, then every two weeks in 1807, then weekly in 1867. In 1997, two weekly draws began taking place, and in 2005 there were three. Over the years the number of wheels involved in the game increased from five in 1864 to eventually ten, which is how many there are today, in 1939. Meanwhile, the number of different bets that players could place also increased gradually since 1864. Until June 2009, Lottomatica used to draw in ten cities around Italy simultaneously, but this was reduced to three—Rome, Milan, and Naples—to streamline operations. On the surface, playing Lottomatica might seem easy because it uses a single 5/90 matrix, meaning you need to choose 5 numbers from a possible range of 90. However, that’s where the simplicity ends. In fact, once you start looking at all the other factors involved, Lottomatica becomes one of the most complicated lotteries you’ll ever come across. In fact, we’d wager it’s possibly the most complex lottery anywhere in the world. While for experienced lotto players and/or bettors this might be a welcome change from other games’ straightforward formats, for normal players Lottomatica’s mechanics might result in a lot of head scratching—at least initially. 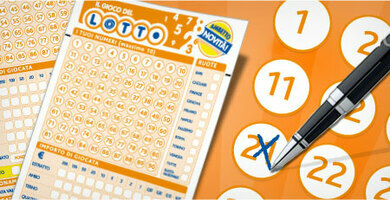 For starters, Lottomatica doesn’t use the same types of drums that are typical of the vast majority of lotteries. Instead, its draws are conducted using an 11-wheel machine, 10 of which are named after Italian cities: Milan, Turin, Genoa, Venice, Naples, Bari, Palermo, Rome, Cagliari, and Florence. Up until the June 16, 2009, draw, all 10 of these cities used to draw the numbers at the same time, but after this date many of the wheels were consolidated for the sake of simplicity. Therefore, the first four wheels in the list above now draw in Milan, the next three in Naples, and the final three in Rome. Rome is also where the 11th wheel, the National Wheel, is drawn from. Correctly guess one number from any wheel. Correctly guess one number from a specific wheel. Correctly guess one exact number and either the previous number of the other one or the number that comes after it. For example, if your second (or first, if you wish to flip the order around) guess was 36, then 35 or 37 would both be considered wins. Bets can be placed on a single wheel, multiple wheels, or all of the wheels, but the maximum number of bets that can be placed on a single ticket is 10. As though all that isn’t complicated enough, you need to make sure that none of your bets contradict with each other. If you’re still reading this, then you’ll probably agree that Lottomatica is, to say the least, a challenging game. In addition, the prize amounts, including the jackpots, are fixed based on how many people win at each prize tier, the numbers that people bet on, and the types of bets that are placed. Despite its complicated format, Lottomatica’s odds aren’t all that bad at 1 in 43,949,268. Compared to Italy’s most famous lottery, SuperEnaLotto (1 in 622,614,630), Lottomatica’s odds are fantastic, but that’s not saying much because SuperEnalotto has the most difficult odds of any lottery on the planet. In addition, SuperEnalotto’s highest jackpot ever reached €177.8 million—a far cry from Lottomatica’s maximum €6 million prize. Lottomatica’s odds are also considerably better than EuroJackpot (1 in 95,344,200) and EuroMillions (1 in 139,838,160), but both of these lotteries also have much more exciting grand prizes. To be honest, even lotteries with MUCH better odds, such as Polish Lotto (1 in 13,983,816), Hungary Hatoslottó (1 in 8,145,060), and Austria Lotto 6 (1 in 8,145,060) have all had higher jackpots than Lottomatica. Lottomatica’s multi-wheel draws take place three times per week on Tuesdays, Thursdays, and Saturdays at 8 pm CET. The three cities—Milan, Naples, and Rome—in which the 11 wheels are located all conduct their draws simultaneously. Official ticket sales end 30 minutes prior to each draw, and usually by 9:30 pm CET on the same evening tickets for the next draw become available. Although Lottomatica’s jackpots have reached some pretty nice levels over the years, there haven’t ever been any truly jaw-dropping amounts—especially when compared to other national and international lotteries. In addition, although there is a €6 million cap on the jackpot, none of the biggest jackpots have come even close to this amount. All prizes are awarded in single cash payments—after the tax has been deducted. All winnings are taxed by Italy's government at 8%. If you are playing from outside of Italy, you should check your country’s local tax laws to see whether your government will tax your winnings as well. If so, you could be taxed twice, which can be pretty painful. If you’re nowhere near Italy and want to get in on Lottomatica’s unique gameplay style, you can do so through an online lottery site. However, as the bottom of this page shows, your options for now are pretty limited. However, playing this particular game online through a third-party service is pretty limited, as all of the complex rules explained above are usually replaced with simply choosing 5 numbers from a range of 90. If that doesn’t suit you, these online lottery sites will let you play many other excellent lotteries from around the world. Italy Lottomatica – Is It Worth Playing? All things considered, Lottomatica is a game that is worth playing, but it’s not for everyone. If you’re looking for great odds and truly life-changing jackpots, look elsewhere because neither of these elements are Lottomatica’s strengths. In addition, its challenging multi-wheel and multi-bet mechanics might turn off players who are just looking for a fun new lotto game to try out. However, if you find the format of regular lotteries too vanilla, too simple, and too similar to each other, then Lottomatica will definitely give you more depth and far more reasons than just big jackpots to come back to it time and time again. Took me a while to figure out how to REALLY play this lottery, but boy am I ever glad I did. Some people (like whoever wrote this review) might not like how "challenging" this game is, but personally I find it great. It's much more engaging than just choosing a few numbers and waiting for a result. It's like a combination of lottery and gambling, which I also like to engage in once in a while.